6000mAh powerbanks on sale at Aldi from Wednesday 17 April 2019. 2x USB outputs and available in black or white. More like 150%. Even with 100% efficiency you'd get ~167%. Pretty sure the power bank outputs at 3.7V while your phone charges at 5V. So, you'd get more like 3.7/5*6000=4440mAh out of it at 100% efficiency. Drop the efficiency to 90% when you account for the heat, and you get around 1 full charge and a half on that iPhone XS. This is brand new and performance will decline over time. Best practice recommends only discharge to 20% for longevity, so you probably want a battery with twice the estimated required capacity. At 100% efficiency (impossible to get anywhere near that), wouldn't you get 6000mAh? Both the battery in the power bank and the battery in the phone will be rated for (x)mAh @ ~3.7V (even though it charges at 5V). That's why we should specify capacity in Wh instead of Ah. Incorrect. The cells inside the power bank have a nominal voltage of around 3.7v. Same as the cells in an iPhone. The powerbank would output following the USB spec. Which is 5V, or higher if it's some fast charge protocol. The phone would accept the 5v (or higher) and drop the voltage in accordance to the CC/CV cycle of the cell. Typically the boost chips are ~94+% efficient. So if you'd like to know how much it would charge your phone, comparing the mAh of the battery pack to the mAh rating of your phone is reasonable enough, adding in some round trip losses (maybe 10%). So expect to be able to charge your depleted iPhone Xs about 2 times using this powerbank. Well, as you can probably guess, I'm no electrical engineer. @Limboi: Yeah that's fair, I'm just really into both bargains AND pedantry. @kevlarman: Yeah, I've seen papers with cells being pushed to 4.4V. @kevlarman: Often the hike in voltage only accounts a very small quantity of Wh at the top end of the battery, a gradual increase above 3.8V over the last 5-10% of charge. The low end will also dip below the nominal and while it won't dip as sharply as 0.55V it'll be lower for a larger percentage of the battery. For practical calculation purposes just using the nominal should be fine. I get so infuriated with mAh - why isn't the use of (m)Wh to avoid any confusion used as standard. Because batteries are treated as being of fixed voltage within their usable capacity. If you've got a 5V device that draws 1A then it's easy to work out how long you can power it from a battery of X Ah capacity. You're right in that it's not as convenient a unit of measurement when charging devices, but that's not where the standard came from and it's not likely to change any time soon. I think it works just as well on samsung in case anyone is wondering. Wow. Good price. This or a 5000 Xiaomi for ~ $20 when I’m special? Thoughts people? It depends. Do you feel special now? Haha. Although this is ok for the low price, 60 day satisfaction return policy and easy return Aldi warranty, I much prefer the slim flat form factor of the Xiaomi 5000mAh which is top quality and even better with a silicon anti slip case on. Although I have many other larger power banks, this is one of my favourite and most used batteries. @ozhunter68: Is there anything like this (size wise) that has USB-C PD? @tonydav: When you say, "this size" do you mean the Aldi one. It looks smallish, but we are not sure on exact size and weight. There are not so many small/light usb C PD power banks, but the old discontinued Cygnett ChargeUp Pro 6000mAh is nice and light and thin/flat, might still find it around if you search. As opposed to the Xiaomi I mention in comment below, this will output on the usb C 15W so not PD, but will output on the type C and A simultaneously ( just tested mine ). The Romoss below is not too big, although not so light too. @ozhunter68: @ozhunter68, was meaning the Xiomi size and weight. Is there any actual benefit of a Powerbank outputting USB-C but not PD over just using a USB-A to USB-C adapter? I know my 2.4A charger will charge my Dell laptop. But slowly. Vs using its PD socket and it's very quick. Can't comment on ShopPro's service, but I've seen deals from their store posted here in the past. Size of the 10000 is too big I think. @Limboi: Haha actually I just checked. 10000 size is same as my old one. It’s perfect. I’ll get that but with USB c. Thanks! @Bellpop: The Xiaomi 10000mAh Pro PLM03ZM is a top power bank being a little thinner and lighter than the old and new 10000mAh and has usb C for QC3 input charging ( not charging other devices ), but only one usb A QC3 output. @Bellpop: The old discontinued Cygnett ChargeUp Pro 6000mAh is nice and light and thin/flat, might still find it around if you search. This is a really handy light and small usb C in/out powerbank that even has that digital % readout too. @ozhunter68: Sounds good but $50 at Hardly Normal. @Bellpop: This new one charges both ways through usb C. Wait for a good deal below $40 delivered. ShopPro are good, Australian based and quick delivery. 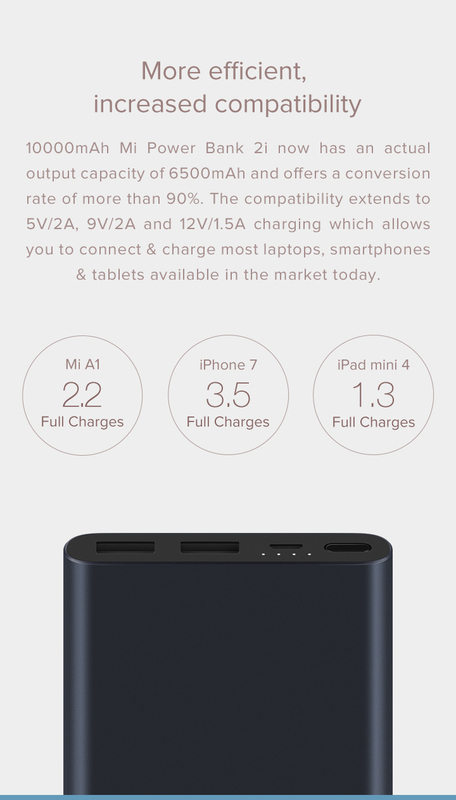 I've got a 20000mAh Xiaomi power bank but bought one of these when they went on special for $18 so I'd have a smaller one to carry in my pocket when need be (Shopro is great by the way, I've bought a few things from there now and can't fault them at all). Solid little charger, although I've only used it once because then I was able to get a free Samsung power bank, which is better suited with one less cable to carry as it's USB-C. I think they're sold out? Cool. Does anyone know if it's microUSB or USB-C? I'm betting it's micro though. 15 cents on it being microUSB! Sorry mate, we only bet eneloops here. Does anyone know what cells are in these? 3000mAh I gather, but which variety? Looks thicc so 3 x 2000mAh 18650 cells. Put me down for 20 cents. Yeah 18650 are a given but Samsung? Sanyo? I was hoping someone might have torn one down previously. Guess we'll have to wait and see. Doubt they are high drain though if you wanted to harvest them for high powered torches. Highly doubt name brand. Probably those cells which have the barcode on them - no clue what to call them. 3 of them of course. Can't seem to find any useful information about them. @cainn: This document appears to be a safety and performance test report for CANFER branded 18650 cells of varying capacities. They don't look exactly the same though (scroll to the bottom for pictures) so make of it what you will. With aldi, I'd be fairly confident that it's actual capacity is close to the rating. Hurry up with the rest of the catalogue! Does anyone still use these since Pokemon GO is no longer a thing? Its still a thing. Spent my lunch hour raiding today. Cracked 26,000,000 XP. Absolutely zero chance that powerbank linked is actually 50,000 mAh. I wouldn't trust those nobrand power banks. That one in particular is especially dodgy. I don't know how they managed to push 50Ah into that bank. It MIGHT be possible had they used 14 high quality 3600mAh (or some other prismatic/pouch cells). Otherwise the capacity rating is flat out wrong. Even the cost of the cells alone would be about $40. So the powerbank is using knock off/low quality or recycled cells, Which won't have the cumulative capacity listed, and worse, it's a dangerous lithium accelerated inferno just waiting to go off. I doubt the powerbank has OCP (Over current protection) or even a fuse. No, there is no "might"
Its actually impossible to do what they are claiming based on size, and weight. You do realise that everything has to follow the laws of physics? That powerbank would be roughly 6000-10000mah depending on how much they want to scam you. Hard to judge actual capacity based on size. Here's a "24,000mAh" battery that's actually mostly sand. Anybody know if 18650s can be harvested from this? It should be, unless inside is three AA batteries with 2000 mah each and it is marketed as 6000mah. lol. Ironically I bought one from China that looks very similar and has AA batteries inside. Into the bin it went. I love my 20,000maH Xiaomi, but yesterday in the mail I got a powerbank phonecase from ali express. Just excellent for my morning walk, always nearly out of charge at the end of my walk due to pokemon. Came back with 100% charge. Not the prettiest/most protective case, but in terms of getting me through the morning walk, it is excellent. Will put on my regular case for the rest of the day. Can someone who owns one tell me if these can charge a device whilst they are being charged themselves? I wish to use one as a UPS for a raspberry pix so it needs to do both at the same time which is a rare feature in these devices. Does anyone see this available at any Aldi store yet? Had sold out at my local Aldi, but managed to pick one up elsewhere. Bought 3 of them, a bit thick but light enough to carry around. 1 was completely flat so charging it up now. Plugged into an iPad Pro 11", seems to be charging fine. I bought two of these and have been doing some capacity tests. This is well out of spec. Suffice to say that if the second one is also this bad they're both going back. I made a pretty silly mistake, unfortunately I ran out of time to edit the original post. The rated Ah capacity is of course at the voltage of the cells, not the USB output. An energy rating in Wh isn't given, but it would be at least 22.2 Wh (nominally 3.7 V * 6 Ah). Accounting correctly for this I measured 19.5 Wh the first time around and 16.5 the second. The first measurement I would still personally consider to be out of spec, while the second is simply unacceptable. I'm going to cycle it a few more times to get a better sample before I move on to the second one. Nowhere on the device, on the packaging or in the manual are the cell voltage or chemistry stated. If it's LFP (3.2 V) then 19.5 Ah is very close to spec. I would expect something as fundamental as this to be stated. I used an inline USB power meter (example) and a USB variable load (example). I would still be wary of the fact that the charge port delivers current. Also, does this mean, we need to test all power pack we buy, either from ebay or from stores ? Too keep or no deal to return. As for Aldi, they're not in the business of misleading their customers in the same way as the Chinese eBay sellers, but I was curious. I might have to open one of these up to see what it contains. So lithium manganese nickel with a nominal voltage of 3.7.